Does it have to be like this? What can we do? Edmund P. Adamus: Formerly Director for marriage and family life in the Archdiocese of Westminster. Currently Professional Adviser to the Episcopal Vicar for Education and Schools Commissioner in Portsmouth Diocese. Anthony Busk: Specialist in forensic social dynamics analysis. The Baroness Cox: Created a Life Peer in 1982. Well known for her international humanitarian work and fearless campaigner for all those suffering abuse. Long standing campaigner in the field of education. Brian Hadley: Independent researcher into the top-level issues underlying global culture change. Robert S. Harris: Robert S. Harris: Author and member of VfJUK and Joint Convenor of the Lords and Commons Family and Child Protection Group. Edmund Matyjaszek: Educationalist, playwright and poet. Edmund is Principal of The Priory School, an independent Christian school on the Isle of Wight. Dr Alastair Noble: Former schools’ inspector and Field Officer for School Leaders Scotland. Philip Quenby: Former lawyer, now writer and film-maker. His five-part documentary Magna Carta Unlocked examines how and why modern civil liberties grew on the back of a failed peace treaty, and what part the Bible played in the process. Lynda Rose: Anglican priest, writer, and CEO of VfJUK. Joint Convenor of the Lords and Commons Family and Child Protection Group. Christopher Shell: Activist and social commentator. Christopher holds a double-first from Oxford and a PhD from Cambridge. 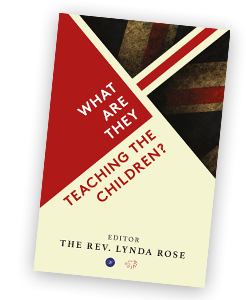 Our contributors, all experts in their own field, examine the how, what and why of the crisis in modern education. Orders will be dispatched following November 24th, after the book’s launch in Parliament.